The Blackburn Rovers forward is back at Tannadice for the first half of the campaign. 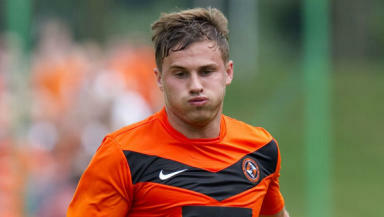 Dundee United have secured a six-month loan deal to see David Goodwillie return to Tannadice. The Scotland international was a fans' favourite in his first spell on Tayside, helping the club win the Scottish Cup in 2010. 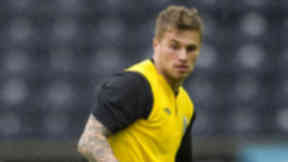 Goodwillie moved to Blackburn Rovers in the summer of 2011 but has seen his limited first-team action under a succession of managers at Ewood Park. United saw an original approach rejected by the Championship side but have now struck a deal to see the 24-year-old return to the SPL. Manager Jackie McNamara told the club's official website: "I am very excited by this signing. We are not only getting an experienced international player but we are also getting someone who has a special affinity with the United fans. "I am striving to improve Dundee United in both the short and long term and adding a player of David's quality will help achieve that. He has all the attributes needed by a striker and it will be a major boost to the club to have him here. "This signing will also excite our supporters. We have asked them to be patient and trust us this summer and they have. A lot of hard work was done behind the scenes to ensure this deal went through and I have to praise the board who gave the financial backing to this deal." United director Derek Robertson added: "In working on this deal for several weeks we have listened to what the fans have said. After contacting a large number of fans who have still to renew their season ticket it was apparent that many were awaiting some exciting transfer news. It doesn't get much more exciting than this and I hope these fans will now come out and support the club's efforts. "The chairman has taken a bold financial decision and we need the fans to back the club accordingly. This signing shows the calibre of player the manager is looking to further add to the squad but in order to do so, we need to encourage more season ticket sales." Goodwillie scored 40 goals in 136 appearances for United before moving to Blackburn Rovers, where he has played 34 times, scoring five. Rovers boss Gary Bowyer says he has not closed the door on the forward returning to resume his career in Lancashire. Bowyer told Blackburn's official website: "We are not pushing David out of the door. "In the two years he has been at the club, he has not played as many games as he would have liked and this move presents him with the chance to play some regular football. "It is an opportunity for him to go back home and play for the club he joined us from and where he made a name for himself. "He will have family and friends around him and we expect him to find his feet very quickly. "We look forward to welcoming him back in January once he has got some games - and hopefully some goals - under his belt."